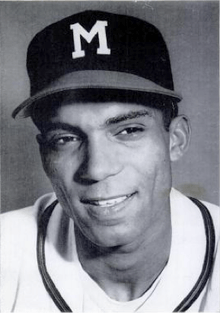 William Havon Bruton (November 9, 1925 – December 5, 1995) was a Major League Baseball (MLB) center fielder who played for the Milwaukee Braves in 1953 through 1960, and for the Detroit Tigers in 1961 through 1964. Bruton batted left-handed and threw right-handed. Bruton was born in Panola, Alabama. Bruton started his career right after the Braves franchise moved from Boston, Massachusetts to Milwaukee, Wisconsin in 1953. In his twelve-year major league career, he posted an overall .273 batting average with 94 home runs and 545 run batted in in 1,610 games. A line-drive hitter and a fleet-footed runner, Bruton led the National League in stolen bases for three consecutive seasons (1953 through 1955), twice in triples (1956 and 1960), and once in runs scored (1960). He led off a game with a home run twelve times. Bruton was a spokesman for Tareyton cigarettes in the 1960s. In 1991, Bruton was inducted into the Delaware Sports Museum and Hall of Fame. Bruton died in a car accident in Marshallton, Delaware on December 5, 1995. ↑ "Bill Bruton Player Page". Sports Reference LLC. Retrieved July 1, 2014. ↑ "Tareyton delivers the flavor...". Ebony. August 1961. Retrieved February 6, 2013.